If one has to define prototype in the simplest of languages, it means a sample or a trial product. And to tell you the truth, the mobile prototyping tools have gained popularity with wide variety of extensive features. Every now and then we come across a new prototype tool for mobile that makes the market further competitive. However, selecting the best prototype tool for the mobile design as such can be a daunting task. But answering a few questions in this context will help in simplifying the job to much extent. Are you actually searching for the Best Mobile Prototype Tool? Now this question needs to be initially answered at the top. You might think it to be silly, but it is important. Are you searching for the prototyping tool just for the sake of remaining in the competition? If you want to test the low fidelity version, then trying out the paper prototyping such as the sketches isn’t a bad idea. People today want to remain updated with the latest mobile technology and design and testing the tool soon after its release will assist to improve the outflow of the work and accomplish favourable outcome. Other than that it helps to reduce the time span needed to develop a new app. Yes, that’s right. Prototyping is one of those tools which do not remain confined to mobile app, but it can predominantly used in desktop apps and websites. This actually decides what type of tool you might have to use. FluidUI is one of the best prototyping tools that is used to make interactive prototypes for mobile, web and desktop. 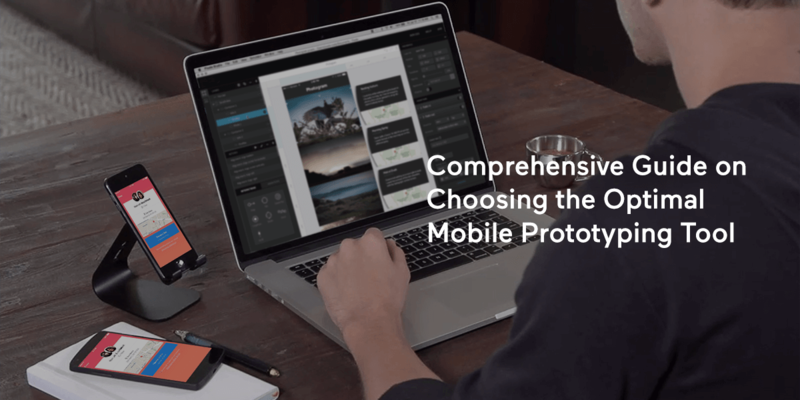 Which Prototyping Tool is Appropriate? Well, it largely depends upon the kind of project and the tool which will solve your purpose. Here you need to be careful and choose the app very attentively because it can provide a new uniqueness to your mobile apps. When you come upon this stage, you will have to choose the tool depending on the type of app you are approaching. For instance, if it is a native based app, then it is best advisable to pick tools such as Form, Pixate, Origami, etc. On the other hand, if you have access to screen mockups, then choosing tools like Concept.ly, Solidify will better suffice your purpose. You should be aware of the fact that there are various stages involved i n the task of prototyping tools. There are different tools for these varied stages. As for example, in the beginning you require low fidelity version and therefore tools like Balsamiq and MockFlow are useful; whereas if you are in the later stages, then high fidelity version such as Invision and Concept.ly is what you need. Well, this is one fact that can surprise you a lot, but the truth remains that most of the UX prototyping tools are not available free of cost. You need to pay in order to access their features. Even those with free accounts have limited access. So, decide your budget when choosing the tools. You can find the interactive fidelity at different levels. However, first you need to decide what kind of communicative flow you are searching for. You can choose either a static page or multi-step interaction. The former is suitable for conceptual and usability testing. It offers you feature like clickable area with hyperlinks and side-ins. And the latter is handy if you are looking for documentation based prototypes. Examples of less interactive prototypes include InVision and the more interactive tools are Axure. This can be regarded as one of the most significant constraints while choosing the prototype tools for the mobile. It is important to take into considerations the expectations of deliverable visual fidelity. This is one task which is usually taken by UXers, mostly in large firms. It is taken on three different levels; high, moderate and low. The pitches are in general high; the usability testing is moderate, whereas the concept proofs are low. All these depend on the target audience and the purpose of the project. If you want to take about some illustrations, then cloud based tools such as Pixate or InVision are helpful for interaction, while some others like Axure or Justinmind is beneficial for creating the explicit visual design. They may use shadows, reused approach or the custom fonts. The third most vital technical aspect which plays a decisive role in selecting an appropriate mobile prototyping tool is the animation and motion. It will be better for you to decide at the commencement of the project if or not you wish to develop animations in prototype. Animation is one such tool that helps to communicate complex interactions. Another essential point to know at this juncture is the level of control over the animation prototype. Here you can avail tools with the facility of in-built animations. Examples of such tools include Blueprint, POP and Xcode. However, they lack customizability. On the other hand, there are stronger animation tools known for their elastic settings and functionality such as the Axure, Justinmind and Proto.io. But if your priority is controlling the velocity, elastic friction etc, then tools like Framer or CSS3 animation can prove useful. The Gestures can be regarded as one of the important factors in choosing the prototyping tools; however, it is not that you might necessarily need the gestural inputs for the project. It is supported mostly by the UX tools. To ease out the matter, it has two categories. The first is built-in gestures while the second is multi-finger input. The POP, Blueprint and AppCooker are the ideal examples of Built-in gestures which we come across in cloud based mobiles. They also have additional features like taps, swipes and flicks. But those which come into the category of multi-finger involve Hammer and Axure. The specific characteristics involve drag and dampening, speed etc. As you can identify from the term itself, collaboration means teamwork. So, if you haven’t developed this quality yet, it is high time for you to develop it for the success of the prototype tool creation largely depends how well the visual designers and developers have gelled together. Talking about the instances, there are single user tools such as Pixate and Framer and tools like POP, InVision etc offers the minimum level of collaboration. But the optimum examples are Justinmind and Axure. As far as demoing is concerned, it one of the important techniques used as tools in the prototyping of the mobile. It makes use of two different methodologies. The first is from computer and the second is from the target device. But it is crucial for you to know which the best technique is that can make your project successful. Now we can relate the examples. If you are considering the first method then you can opt for the Pixate, Flinto and Framer. For the target device the best tools would be Blueprint, POP and Marvel. It is essential to check if the prototype will support the native or the responsive web design; In addition to that you also need to determine whether the responsive design will support adaptive or fluid layouts. Also check if it has a collection of responsive widgets and the procedure of demoing it into the tool. Axure allows you the adaptive feature while the Proto.io and Justinmind offers Fluid design features. It is evident to know that because of the interactions some of the prototypes need no documentation. It is necessary where a lot of business complexity is involved. It helps in getting the minute details that cannot be seen in the prototype. Examples in this case are Axure and Justinmind. There are some other vital factors that can be taken into account for selecting The Best Mobile Prototyping Tool. These include Learnability, cost of the project, technical assistance and lastly the third party resources. Therefore, we have seen in some detail, the various factors which must be considered for picking a mobile prototyping tool. The article discusses more on the technical aspects and also offers the best of the illustrations on each of the vital points. However, it is ultimately you who have to take the final call depending on the specific project requirements and criteria. You need to have knowledge on coding as well as be proficient in visual design. Above all, take the decision very calmly and cool headed.